Car Rental Guide for online car rental & car hire in Johannesburg, South Africa. Competitive car hire rates. All vehicle types - sedan, 4x4, SUV, minivan & pick-up. The Johannesburg of is a modern version of its inauspicious but frantic beginnings. Unlike most other major cities, was not founded near water. Inland, and perched on the 80km long rocky outcrop of the Witwatersrand, Johannesburg's existence and growth came from the financial waters left behind - gold. 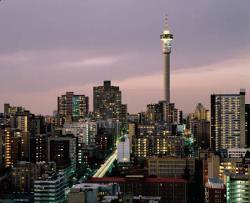 Johannesburg is the technological and financial forerunner of Africa, South Africa's premier business destination and home, including Soweto, to more than five million people. Built on and maintained by the ancient ground it covers, Johannesburg is the prince of the subcontinent.